We've been getting some comments that this blog should be more positive. With all the negative news circulating around the program lately, we couldn't agree more. So here's some good news that I read this morning via ESPN's Big Ten blogger Adam Rittenberg. We did our preview of the OL last week. In it, we walked through each position and which players would, and should step up this season. I believed then, and believe now that the OL is probably the strongest position we have this year. 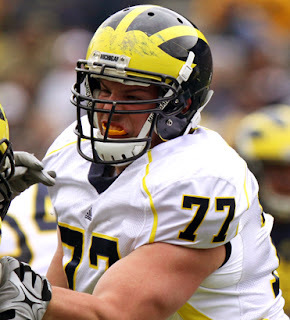 The 2010 OL is shaping up to be the most experienced and deep OL unit Michigan has seen in many many years. 3. Michigan: The Wolverines boast one of the Big Ten's best interior line tandems in guard Stephen Schilling and center David Molk, who returns from an ACL injury. When Molk was healthy in 2009, Michigan consistently moved the football. His return is a major boost. The Wolverines need to solidify the tackle spots but have experienced options in Perry Dorrestein and Mark Huyge. Michigan's offensive line recruiting also should pay off as redshirt freshmen like Taylor Lewan solidify the depth. The top 5 is Wiscy, tOSU, Meeechigan, Penn State and Northwestern. This marks the first time a UM position unit has made the top 5 of Adam's pre-season rankings. We didn't make the top 5 of any of the defensive positions...obviously, but it's good to see that the OL is getting some much deserved love. No doubt, Molk will bounce back after the ACL injury. podiatrists and the medical staff are helping him on rehab.